I went to listen to Kate DiCamillo at the Wheeler Centre last June. Yes, I know, where have I been, that was ages ago. Well, I had my website re-done and I didn’t like it and it’s attached to my blog which I couldn’t access, so it’s a long, long story. Anyway, my point is I haven’t stopped thinking about Kate since, nor the advice she gave. Kate spoke about the difficulties of writing. This had me on the edge of my seat, writers like her had difficulties? This was a revelation. I just assumed beautiful words just flowed from her fingertips. Not so. It’s complex, she tells us. Then she quoted Dorothy Parker, and I love her even more. Kate writes two pages at 5am every morning. At this hour, when all is muted and quiet, she has a foot in each world. She journals, goes back to earlier pieces and works her way through things. She writes without an outline, she has names and scenes and finds her way. She says she cannot make herself talented, but she can do the work. She asks herself, am I afraid or am I lazy? She admits to both but always pushes forward, focusing on one day at a time, then a week, getting to know her characters until they take over. The first draft is often a mess and it always takes seven drafts before a novel goes to an editor. Kate tells us to commit to writing and to find a way to do the work. Keep our minds open and our hearts and ears and eyes. The Miraculous journey of Edward Tulane is one of my all time favourite books. It’s achingly heart breaking and the first time I read it, I sobbed the whole way through it. Kate’s connection to Edward is so visceral and real, for anyone who’s loved a dolly, a bunny or a teddy bear, this is the book for you. Edward Tulane was inspired by a gift. Kate was given a rabbit doll. A very large rabbit doll. It freaked her out but she dreamt about it underwater one night and the story started from this image. It was a picture book, but the story unfolded and told itself, becoming a novel. Kate makes time to read every day, she’s most present when she’s reading. Daydreaming is essential to every writer as it ‘maximum’ staring (I love this). Leave your phone off and don’t talk about your work. You’ll jinx it. Just sit down and do it. Kate DiCamillo takes us on an extraordinary journey, from the depths of the ocean to the net of a fisherman, from the top of a garbage heap to the fireside of a hobos camp, from the bedside of an ailing child to the bustling streets of Memphis. And along the way, we are shown a true miracle: even a heart of the most breakable kind can learn to love, to lose, and to love again. Kate DiCamillo is one of the United States’ leading junior fiction and illustrated fiction authors for children. She has sold over 22 million copies worldwide, with books translated into 41 languages. Kate is one of only six people to have won two prestigious Newbery Medals, awarded by the American Library Association, for The Tale of Despereaux (2003) and Flora and Ulysses (2013). Kate recently completed her two year appointment as the Library of Congress’ National Ambassador for Young People’s Literature 2014–2015. She is the fourth US National Ambassador for Young People’s Literature. Today, I’d like to welcome Andrew McLean to my blog. Andrew McLean is one of Australia’s best-loved and most highly awarded illustrators of children’s books. His CBCA award-winning titles include You’ll Wake the Baby!, My Dog and Reggie, Queen of the Street, and he has also illustrated a number of picture books with his writer wife, Janet. 1. Andrew, what was it that attracted you to the story of Fabish? As soon as I read the manuscript I was hooked. Fabish is set in a real place, about a real event and real people and animals. I felt an immediate connection to the story. Fabish is a moving story, beautifully written. Your empathy with and knowledge of horses is obvious. There many descriptive passages about the atmospherics that can’t be illustrated, like the heat, the wind, the crackling of the fire, the rattling of the roof. In a picture book the two elements of words and pictures have to work together. I often take a cinematic approach to illustrating a picture book. Fabish lent itself to that way of working. And of course it had a moving and satisfying ending. 2. Tell us about the process you went through to choose the right medium and the grade of paper to illustrate Fabish? Over the years I have used all sorts of different papers. Basically, for watercolour painting, there is hot press, that is more heavily sized, smoother and harder that cold press, which is less heavily sized and often has a texture or tooth to it. I have found that hot press is great for illustration that requires detail, but it is a less forgiving paper when taking a wash than cold press that leaves softer marks. Because there is a lot of landscape in the story I chose cold press because it is rougher and more suitable for an impressionistic approach. 3. How did you find the experience of drawing a bushfire? The experience of painting the bushfire was challenging. There was no shortage of bushfire pictures and videos, so I had lots of material to work with. I used watercolour mostly, but used pastel, wax crayons, and white paint at times to leave crisper marks on the paper to represent shooting sparks, etc. For the aftermath I used charcoal (burnt wood). This was perfect for the tree trunks, and when combined with pastel, was great for creating smoke effects. You’ve done an amazing job, Andrew, the bushfire scenes feel real. 4. How long did it take you to do the illustrations? My recent process has involved using my iPad to do the roughs. First, I draw on paper with pencil or charcoal to size of the book then photograph the drawing and import it into an App called Sketch Club on my iPad. This allows me to paint much faster than with real paint on paper. With Sketch Club I can paint intuitively using just my finger. This is different from the working on the Photoshop or Illustrator Apps, that requires computer knowledge that I don’t have. As I do each rough on Sketch Club I can email it directly to the publisher, and get useful feed back as I go along. It also means I have a colour rough when it comes to doing the final artwork. I aim to complete the roughs in about three months, and the final artwork in four to six months. As I get older I seem to be working smarter – not having the repeat drawings so much. 5. Tell us about drawing horses? 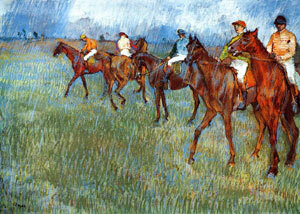 With the drawing of horses I had a lot assistance from Degas. He drew horses like no-one else. Before Edwearde Muybridge (and he was weird) painters tended to paint moving horses like merry-go-round horses – with two legs stretched out in front and two legs stretched out behind. (Incidentally, when Muybridge found out the child born to his younger wife was not his, he sought out the real father and shot him dead. He was acquitted, the jury being of the opinion that the adulterer had it coming to him). 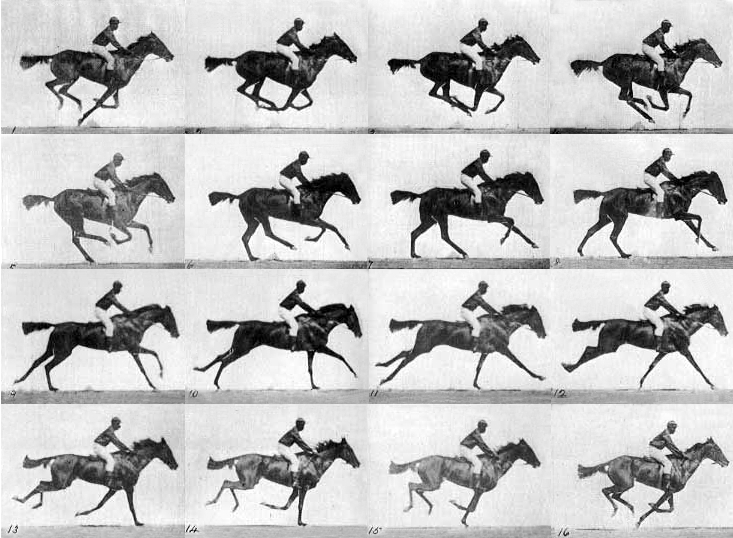 Anyway, Muybridge was paid by a wealthy San Fransisco horse owner to try and prove whether at some stage when running horses had all of their feet off the ground. He built a long shed, with a gridded wall on one side and a battery of cameras at close intervals on the opposite side as it ran through the shed. If you place photographs in the order they were taken and flick them rapidly you will see an image of a moving horse, with its feet off the ground at a certain point. He certainly changed the way artists painted horses. Now they had photos that froze them in mid-stride, no more merry-go-round horses. Wow, that’s fascinating stuff, Andrew. A big thank you to you, Neridah, for writing this wonderful story and to the editor Sue Flockhart, the designer, Sandra Nobes and all at Allen and Unwin for doing such a marvelous job with the production. The look and feel of the book is beautiful. Thanks Andrew, it’s been my pleasure. And yes, I agree, a big thank to everyone at A&U. Thanks for coming onto my blog today. I’ll keep you posted when the date of the book launch has been finalised. I feel very lucky today to welcome Coral Vass to my blog to celebrate the launch of her latest book. It’s part of the Random House ‘Meet Series’ about the extraordinary men and women who have shaped Australia’s history. Meet…Don Bradman is a children’s picture book about cricket’s greatest ever batsman, Sir Donald Bradman. It’s the story of how he first came to play for Australia, and how his record-breaking feats in the Ashes series became a source of pride and hope during the hard years of the Great Depression. As we’re huge cricket fans, it’s very exciting to see more picture books about cricket! Coral’s book has been beautifully illustrated by Brad Howe. Don’t you think his style suits the era of this story perfectly? I do. Congratulations Coral and Brad – it’s such a beautiful book. Were you a cricket fan before you wrote this book? I wouldn’t say I was a die-hard fan, but I have always enjoyed watching cricket on TV. My three sons however, utterly love everything there is to love about cricket. And since writing this book, I have gained so much more appreciation for the game. What did your research involve? I had a lot of fun researching the life and career of Sir Donald Bradman. The internet is not always a reliable resource, so I visited the libraries frequently; borrowing countless books on Bradman, as well as watching old footage of the game and various interviews. What was the most interesting fact you found out about Sir Donald Bradman? Despite his relatively quick rise to fame, Donald Bradman actually had many knock backs. Most Australian cricket selectors initially didn’t see his cricketing potential; thinking his batting style was unconventional. But with persistence, hard work and a little bit of luck, Donald went on to become cricket’s greatest ever batsman. Don’s story offers a great message of hope, hard work and persistence for all children. 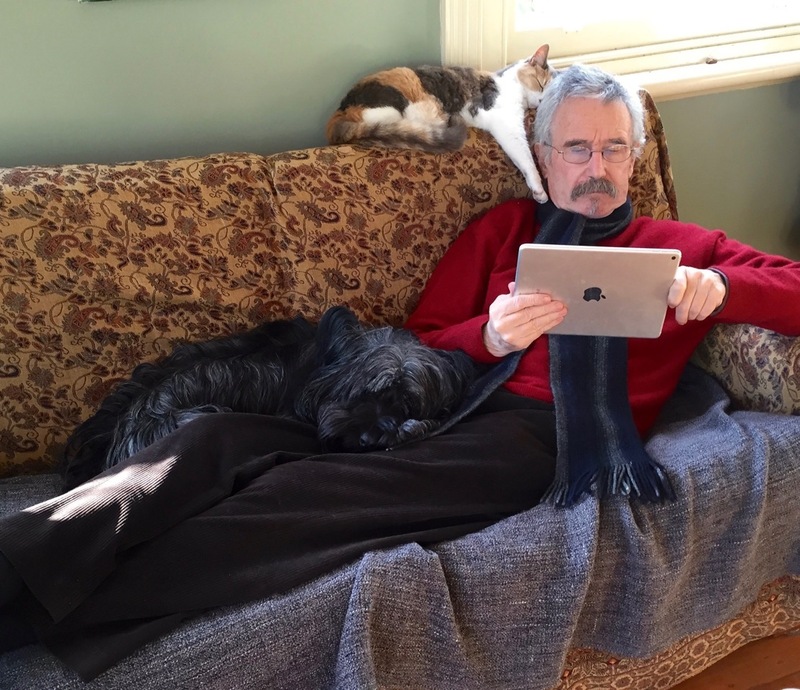 What was the best part about working with Brad Howe and Random House? It was an absolute honour and thrill to be given the opportunity to profile such an amazing Australian legend. And watching Brad Howe bring this story to life with his phenomenal illustrations was a joy. Brad’s illustrations work perfectly with your text, Coral. Did your opinion of Don Bradman change or deepen as you wrote the book? My appreciation of Donald Bradman grew immensely as I researched and wrote this book. I definitely have much more admiration and a deeper respect for him as a sportsman and a person, as I gained insight into his character. As well as being a phenomenal talent, Sir Donald Bradman was a man of enormous integrity and humility. The most challenging part was making sure I got it right. The hardest thing about writing non-fiction is checking, double checking and triple checking that all the details are correct. Added to that was the pressure of writing about and making sure the story honoured this extraordinary man -Sir Donald Bradman. I definitely think you’ve got it right. Well done you. Coral Vass and Brad How‘s book ‘Meet Don Bradman’ can be purchased from any good bookstore. So, as Molly would say, do yourself a favour…and go out and get it! ‘Saudade’ is a Galician Portuguese word with no direct translation into English. It’s a deep emotional state of nostalgic longing for an absent something that one loves. It often carries a repressed knowledge that the object of longing will never return. The story of baby elephant's fight for survival.